The Parish life committee is asked regularly to cater funeral lunches. Proceeds from these are used to purchase items for the church. At Ascension we have many events and activities that take place over a year. Members and regular attendees are assigned to one of our four Community Lists. The purpose of these is to provide communication, and to provide service when asked. You will notice at the top of the list is ‘Leader’. When events are taking place at Ascension that need to be communicated the Leader will get the information. They in turn contact each of their ‘Shepherds’, who will then contact you. The Shepherds are indicated in Bold/Underlined text. When asked to do so, service is also provided. Each month a group will be responsible for making the coffee (a very important service!) 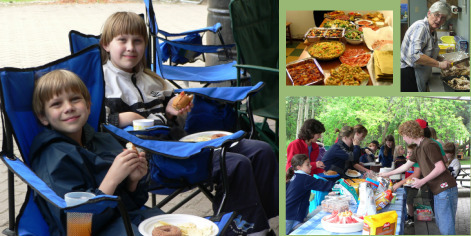 When a potluck or other activity is taking place each group will take turns setting up and cleaning up for the event. So occasionally your Shepherd will call and ask if you are available for Coffee making or helping to set up or clean up for an event. It’s fun, it’s easy and it is a great way to connect with others who attend our church.